November 22, 2013 – D-Link, the cost-effective, standards-based unified networking solutions provider for SMB and enterprise IT environments, expanded the portfolio of switching solutions with L3 Managed Gigabit Switch DGS-3120-48TC/B1ARI, offering the ideal balance of performance, security and management flexibility. Created on the advanced hardware platform, DGS-3120-48TC/B1ARI supports the new Routed Image software with enhanced routing functionality, including VRRP, Static Route (IPv4/IPv6), RIP (v1/v2/ng), OSPF (v2/v3), PIM, DVMRPv3, PBR, IPv6 Tunneling, DHCP Server, IGMP (v1/v2/v3) and MLD (v1/v2). In addition to the new routing functionality D-Link DGS-3120-48TC/B1ARI provides businesses with extensive security features, uncompromising performance, and ease of use making it an ideal access or aggregation layer solution for ISP, SMB and enterprise networks. 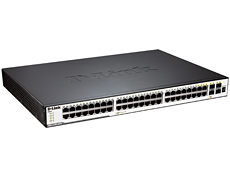 The announced DGS-3120-48TC/B1ARI is 19-inch rack mountable switch that provides 44 Gigabit Ethernet ports, 4 combo 10/100/1000BASE-T/SFP ports, 2 10G CX4 interfaces (uplink), console port (RJ-45) and SD Card slot, allowing the user to boot images and upload configuration files directly from an SD Card and, if necessary, conveniently save onto it syslog files. The switch also offers the opportunity to use external redundant power supply such as DPS-500 or DPS-500DC, so that continued operation is assured. The DGS-3120 Series with Routed Image doesn’t support physical stacking. D-Link DGS-3120-48TC/B1ARI is currently available for the order at the suggested retail price of $1720. D-Link is the global leader in connectivity for home, small business, mid- to large-sized enterprise environments, and service providers. An award-winning designer, developer, and manufacturer, D-Link implements and supports unified network solutions that integrate capabilities in switching, wireless, broadband, storage, IP Surveillance, and cloud-based network management. For more information, visit D-Link website.